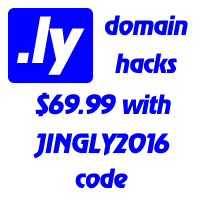 Some people indeed, misspell .ly as .li, so it is worth to mention such jingles too. This is a great way to stay on top of all that is shared by the people you follow - even if you are not connected 24/7! Nevertheless, as our recent research argues, .com in such cases is a minimal asset as it does not provide any significant traffic. People will google it and find the site they need in just 10 seconds.